Simultaneously, one of the greatest pains and pleasures of being a botanist is the amount of time it can take to consolidate and write up on the findings of a single field trip. I thought the fieldtrip to the Tom Gibson Nature Reserve among one of those deserving a writeup, at least for the purpose of documenting the botanical ‘lifers’ I had encountered there. I have attached most of the photos in a Picasa web album folder. The visit to the reserve was made on the 14th of November 2009. The fieldtrip was organized by the Threatened Plants Tasmania group and the Department of Primary Industries, Parks, Water and Environment (DPIPWE) and was attended by some twenty or so participants. Among those present were plant experts, namely Richard Schahinger (from DPIPWE), John Davies (from GDH), Mark Wapstra (from ECOTas), Ray Skabo and Phil Collier (TPT president). The Tom Gibson Nature Reserve is of conservation significance for it’s high botanical diveristy and wealth of rare plants. 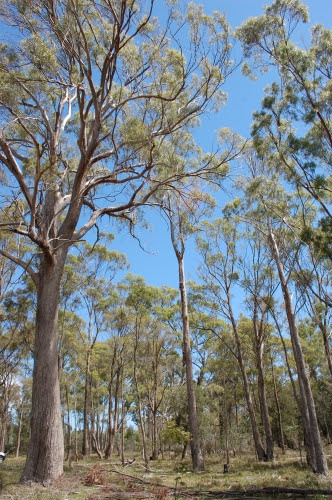 We visited the southern part of the Tom Gibson Nature Reserve, a 659.8 ha block of beautiful dry eucalypt forest and woodland (See the description by Parks and Wildlife). Upon entering the reserve we were greeted by a whole forest understorey full of Tiger Orchids (Diuris sulphurea) the likes of which I have never witnessed before. Also in sight were a couple of rare plants including the Chocolate Lily (Arthropodium strictum) and the endemic Propeller Plant (Stenanthemum pimeleoides), betokening the great botanical treasures to be seen thereafter. We drove in a little further into the center of the reserve and came to a rather dry and drab looking rock plate. Dull as it might have appeared, it was the abode of a number of rare daisies. One of these was the Moss Sunray (Hyalosperma demissum), a very compact plant that looks like a moss turf. Another was the Dwarf Sunray (Triptilodiscus pygmaeus), a distinctive trailing yellow flowered daisy. 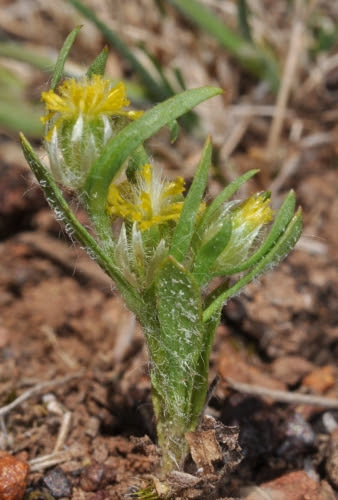 Yet another was the Small Wrinklewort (Siloxerus multiflorus), a little herb with small heads of flowers. All of these were extremely diminutive plants scarcely taller than a few centimeters. Pressing on towwards the western edge of the reserve, we came to distinctive habitat in the reserve, a soak no larger that perhaps 5-10 square meters. Here, Richard Schahinger pointed out a number of threatened plants which included the Small Triggerplant (Stylidium despectum), Tiny Water Milfoil (Myriophyllum integrifolium), the Slender Fanwort (Aphelia gracilis) (see my previous post) and the Tiny Arrowgrass (Triglochin minutissimum). Finally, at the last stop for the day at the northern part of the reserve, we botanized around a rocky grassy spot where we encountered the Dwarf Fanwort (Aphelia pumilio) and the Grassland Candles (Stackhousia subterranea). Other interesting plants there included the Australian Carrot (Daucus glochidiatus). In the vicinity there was also a small soak by the dirt road in which grew a healthy population of an interesting fern ally, the Plain Quillwort (Isoetes drummondii subsp. drummondii). Thats 12 rare plants in a day, the bulk of which I was seeing for the first time! Quite frankly, little else excites a botanist than the opportunity to make an acquaintance with new plants. Much thanks to the excellent work of the Threatened Plants Tasmania group, DPIPWE and to foresight of Tom Gibson, the former owner of the land who kept the area intact. 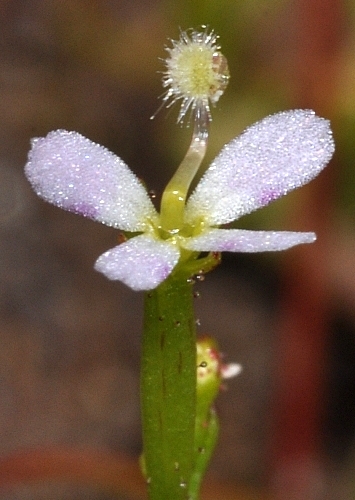 This entry was posted in Fieldtrips, Parks and Nature Reserves, Threatened Plants and tagged Athropodium strictum, Chocolate Lily, Dwarf Sunray, Hyalosperma demissum, Moss Sunray, Myriophyllum integrifolium, Propeller Plant, Richard Schahinger, Siloxerus multiflorus, Small Wrinklewort, Stenanthemum pimeleoides, Stylidium despectum, Threatened Plants Tasmania, Tiny Arrowgrass, Tiny Water Milfoil, Tom Gibson, Tom Gibson Nature Reserve, Triglochin minutissimum, Triptilodiscus pygmaeus. Bookmark the permalink.